Risk is ubiquitous on the waterfront, and the effective identification, mitigation and management of that risk is critical to long-term success. Maritime Professional delivers insights from four acknowledged industry leaders from four distinct sectors and geographic regions as to the secret of their success. RISK? 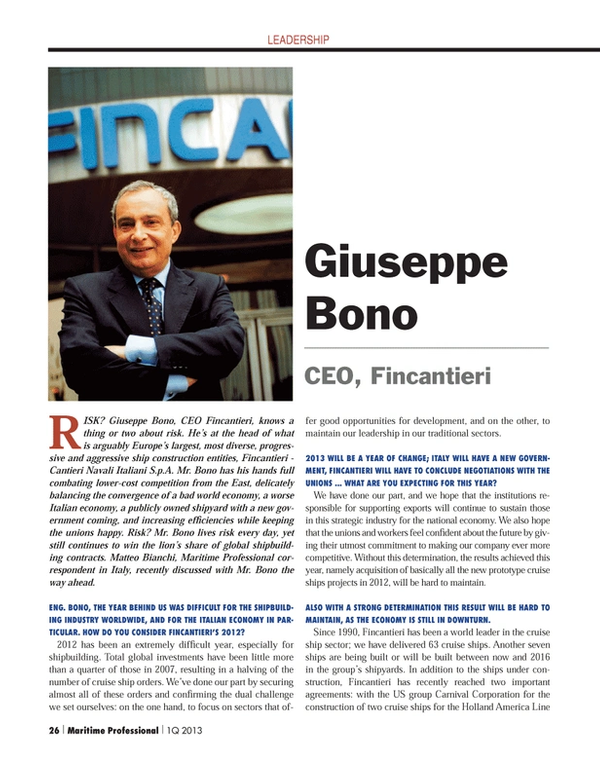 Giuseppe Bono, CEO Fincantieri, knows a thing or two about risk. He’s at the head of what is arguably Europe’s largest, most diverse, progressive and aggressive ship construction entities, Fincantieri - Cantieri Navali Italiani S.p.A. Mr. Bono has his hands full combating lower-cost competition from the East, delicately balancing the convergence of a bad world economy, a worse Italian economy, a publicly owned shipyard with a new government coming, and increasing efficiencies while keeping the unions happy. Risk? Mr. Bono lives risk every day, yet still continues to win the lion’s share of global shipbuilding contracts. Matteo Bianchi, Maritime Professional correspondent in Italy, recently discussed with Mr. Bono the way ahead. Eng. Bono, the year behind us was difficult for the shipbuilding industry worldwide, and for the Italian economy in particular. How do you consider Fincantieri’s 2012? 2012 has been an extremely difficult year, especially for shipbuilding. Total global investments have been little more than a quarter of those in 2007, resulting in a halving of the number of cruise ship orders. We’ve done our part by securing almost all of these orders and confirming the dual challenge we set ourselves: on the one hand, to focus on sectors that offer good opportunities for development, and on the other, to maintain our leadership in our traditional sectors. 2013 will be a year of change; Italy will have a new government, Fincantieri will have to conclude negotiations with the Unions ... What are you expecting for this year? We have done our part, and we hope that the institutions responsible for supporting exports will continue to sustain those in this strategic industry for the national economy. We also hope that the unions and workers feel confident about the future by giving their utmost commitment to making our company ever more competitive. Without this determination, the results achieved this year, namely acquisition of basically all the new prototype cruise ships projects in 2012, will be hard to maintain. Also with a strong determination this result will be hard to maintain, as the economy is still in downturn. Since 1990, Fincantieri has been a world leader in the cruise ship sector; we have delivered 63 cruise ships. Another seven ships are being built or will be built between now and 2016 in the group’s shipyards. In addition to the ships under construction, Fincantieri has recently reached two important agreements: with the US group Carnival Corporation for the construction of two cruise ships for the Holland America Line and Carnival Cruise Lines, and with Viking Ocean Cruises for another two cruise ships. These results confirm Fincantieri’s world leadership in the cruise ship sector, even at a time of slowing demand. Exactly one year has passed since Costa Concordia sunk off of Giglio Island. How is the relationship between Fincantieri and the largest cruise shipping company Carnival Corporation at the moment? Carnival, and Costa Cruises in particular, remain for us and for the country, exceptional and indispensable investors. Out of 63 ships delivered 52 were for different brands in Carnival Group, 13 for Princess Cruises; Costa Diadema will be the 10th Costa ship built by Fincantieri in Italy since 2000, with a total investment worth almost 5 billion euros. We hope that this order is a strong signal for an upturn by a strategic sector for the country’s economy and the industry as a whole. Fincantieri, even in a difficult moment as today, is resolutely continuing its commitment in a particularly depressed market in order to gain whatever orders there might be, thus holding on to its position as world leader. What does the purchase of STX OSV mean for Fincantieri? This transaction is a source of pride for all Fincantieri’s employees and business partners. It marks the beginning of a new era for Fincantieri. The acquisition of STX OSV will further enhance our position as a leading international competitor. It will strengthen Fincantieri’s commitment to pursuing a strategy of diversification and development in order to retain our long-term competitiveness and generate important positive impacts for our Italian assets. I’m sure this is the right way forward to optimize our global leadership position in the high value-added end of the shipbuilding industry and to establish ourselves as champions of the Western world.